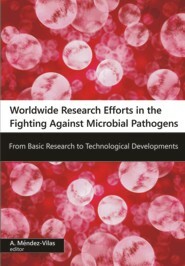 This book aims to disseminate recent findings in the fight against microbial pathogens which were presented at the second edition of the ICAR Conference Series (ICAR2012) on Antimicrobial Research, held in Lisbon, Portugal, November 2012, which attracted about 425 scientists from 55 countries. This forum was the natural continuation of this new series of conferences: the first edition, held in Valladolid, Spain in 2010, gathered more than 500 researchers from nearly 60 countries. ICAR aims at establishing itself as a key forum in Europe for the presentation, exchange, and dissemination of information and experiences on anti-microbe strategies. "Anti" is here taken in the broadest sense as "against cell cycle, adhesion, or communication," when harmful for the human health, industry or economy (e.g. infectious diseases, chemotherapy, food, biomedicine, agriculture, livestock, biotechnology, water systems). Topics on antimicrobial natural products, antimicrobial resistance, antimicrobial surfaces, as well as methods and techniques, are included. This volume is a compilation of chapters written by active researchers that will provide readers with an up-to-date information about the current knowledge on antimicrobials in a worldwide context marked by the threat posed by the increasing antimicrobial resistance of microbial pathogens.